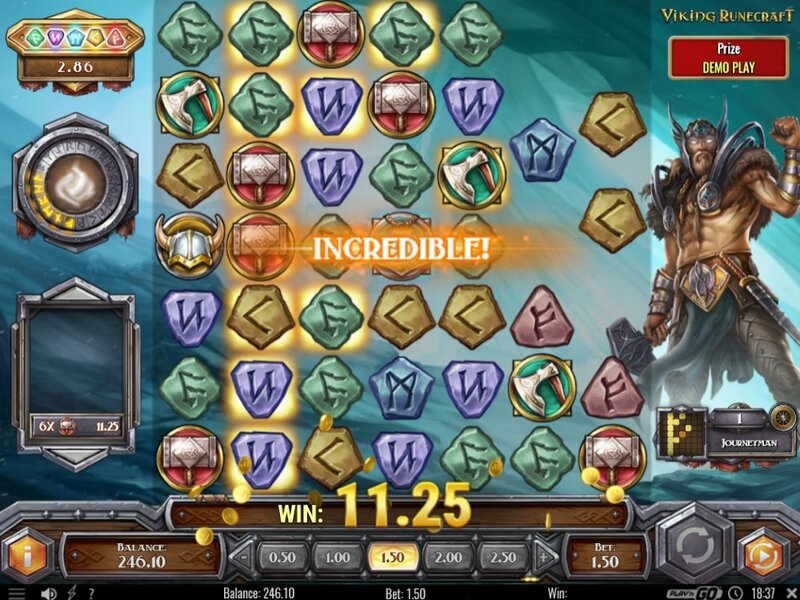 There are a surprising number of online slot games which use the violently marauding Vikings as a theme. Among these are many quality games, but the Casino Gorilla was immediately impressed by this effort from Play ‘n GO. In an industry where there are more followers than leaders, it is a refreshing change to see Play ‘n GO taking some risks and producing a truly innovative slot game which merges aspects of social gaming with casino gaming. Let’s find out what has gotten the big guy so excited about this game. 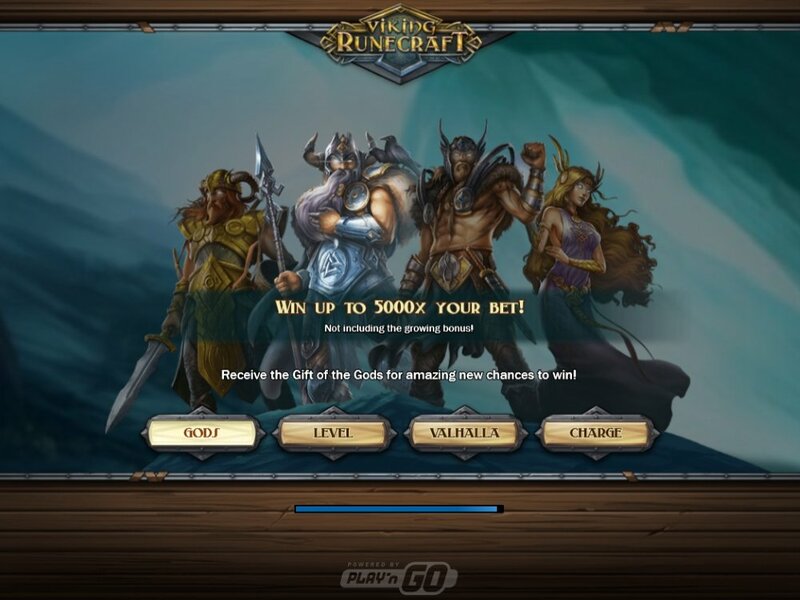 As soon as you open the gaming screen you will realise that Viking Runecraft is not just another ordinary slot game. This epic tale plays out on a 7 x 7 grid packed with Nordic symbols and a Viking warrior stands to the right of the board, poised for action. To the left of the reels you will see a curious looking circular symbol, whose purpose we will explain below. The cost of a spin starts out at a minimum of 50p and rise all the way up to £100 for those with deep pockets. 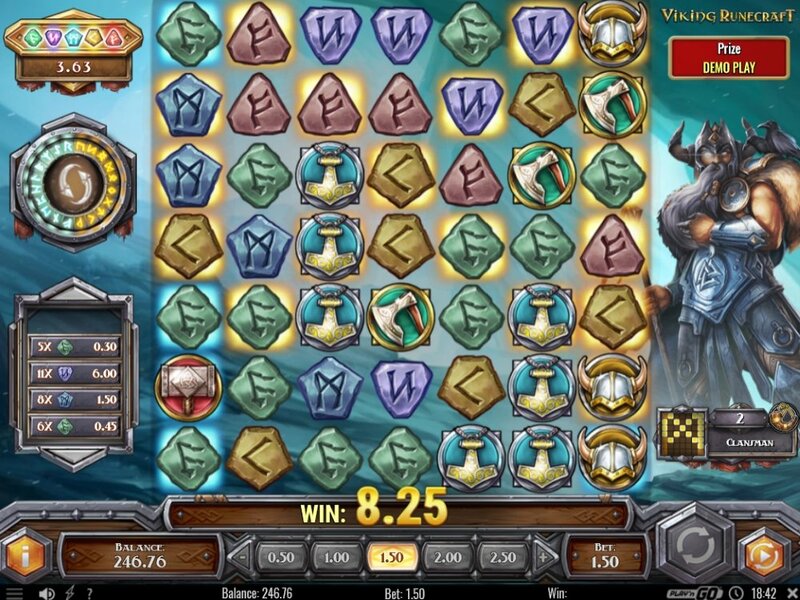 Viking Runecraft is far from a traditional 5 or 3 reel slot game. Instead you score wins via the cluster pays method, meaning that you must find groups of at least 5 of the same symbols connected horizontally or vertically. This game also uses the cascading symbols feature, so that any symbols that form a winning cluster will disappear, and new blocks drop from above. 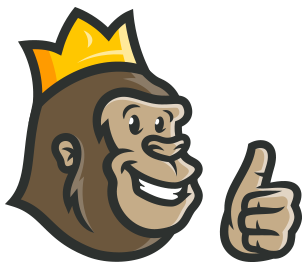 If you have played a game like Gonzo’s Quest or Jungle Jim you will know that this means you can go on winning sequences to boost your profits. In total there are nine base symbols populating the reels. These are made up of five different coloured carved stones, and then the higher value images are the amulet, axe, Viking helmet and hammer. If you manage to find 15 or more of those hammers then you will be rewarded with 1500 times your bet. It is possible to form more than one cluster of symbols on the same spin, and of course as new symbols cascade down from above further consecutive wins are possible. As you get your wins you will notice that the circle on the left of the screen begins to charge, so let’s jump into the many features available from this game to see what that means. That mysterious circular dial is a meter, and it becomes charged when you make winning combinations, and it fills up when 20 winning symbols are uncovered. Fury of Fenrir: 2 diagonal lines of symbols are removed from the board and a further 2 lines become the same symbol. Judgement of Jormungand: a centipede-like creature forms a winding path from one end of the grid to the other, with all the symbols in this path changed to the same symbol. Lure of Loki: 1 symbol is completely removed from the grid, and another is changed to another symbol and hopefully will match up with more of the same symbol to form wins. Scorching of Surtr: 3 symbols go on fire and the fire spreads to surrounding symbols, all of which become the same symbol. If your winning streak continues to 40 symbols then you enter Ragnarok mode, which is a bonus game. Every time you make a spin without a winning cluster one of the four features will be unleashed on the board. This continues until all four features have been used. It’s a lot to take in, but the special features of this awesome game aren’t done just yet! 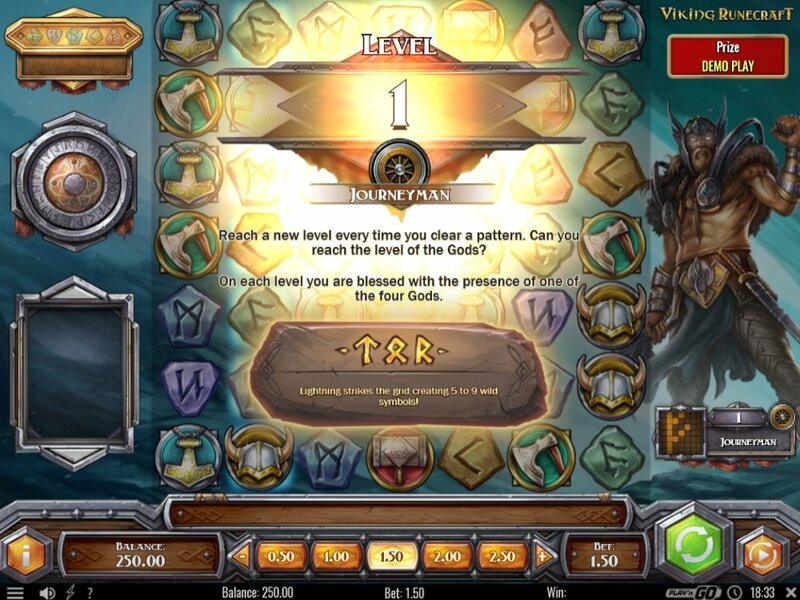 When you first begin this game your Viking warrior – remember the one standing to the right of the reels? – begins as a level one ‘Journeyman’. He is watched over by the God of Thunder, who can strike lightning onto the grid at any time, turning all the symbols that are struck into golden wilds. Behind the symbols you will notice blue glowing squares which form a pattern. Every time a winning cluster uses one of the symbols on a blue square, the square will turn gold. When the entire pattern becomes gold – which only requires patience as the symbols don’t change back for as long as you keep playing – then you will move to the next level. The Journeyman becomes a Clansman with a new god – the God of Wisdom assisting with a new random bonus. There are four levels with four different gods, with the God of Beauty and God of Guarding awaiting those players who persevere on the reels. Is it possible for a slot game to have too many features? Not if you ask the Casino Gorilla! The final feature in this action-packed game involves the five low value symbols. Form winning combos with these and you will see the symbol light up on the top left of the screen. When at least one has been discovered and you clear the pattern to move to the next level, you will activate the Runes of Valhalla bonus feature. Here you spin a wheel and if you hit any of the active base symbols you win a bonus amount. The more symbols you have lit up, the better your chances of winning that bonus. This Viking adventure has got so many different bonus features that it seems like a lot to take in. However, while it may sound complicated it will all become clear once you start spinning those reels. Play ‘n GO have really thrown everything at this slot, not the least of which are the sophisticated graphics and animations and the atmospheric sound track. Sometimes you start playing a game and quickly realise that it has the potential to be an instant classic: Viking Runecraft is one of those. 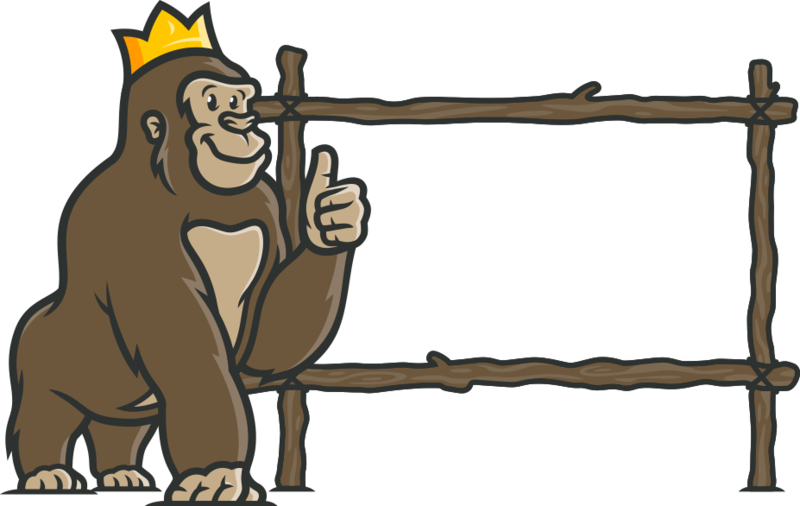 From its release in 2017 the Casino Gorilla has been a big fan of this game, and he suggests that you don’t waste any more time and seek out this Norse-themed slot to start discovering why it’s an all-time favourite. Betting here was so easy. I signed up and got a match bonus right away. Started playing some slots and won a few times. Not huge payouts, but enough to keep you going. Loved it! A truly fun and exciting game based on the ancient Viking mythologies. From the gameplay to the numerous generous bonuses, this game had me at the edge of my seat at all times!